A new templating system provides faster, more compact output for maps and mashups. MapPress is compatible with WordPress 4.5 and higher. See the Installation Instructions for information about installing the plugin. MapPress supports two mapping engines: Leaflet and Google. The engine selected controls which map ’tiles’ (backgrounds) are displayed and how addresses are geocoded (matched to latitude/longitude coordinates). Google – Google Maps look great, but Google requires billing information and a complicated API key. Google has strict free usage limits, so it can be very expensive for high-traffic sites. Leaflet – Leaflet is a popular free, open-source alternative to Google. The leaflet engine uses geocoding from Algolia. By default Leaflet uses plain map tiles from Open Street Map (OSM). More detailed map tiles are available from Mapbox (sign up to get a Mapbox access token). Mapbox isn’t free but their free usage level is higher than Google and their paid usage is less expensive. Inline directions are not available. Directions are provided from Google Maps. After you activate MapPress. You will notice a MapPress ‘meta box’ has been added in the WordPress post editor. If you already have some maps you’ll see an initial list of maps. Click a map to edit it, or click the “new map” button to create a new map. Map ID: when a map is saved it is assigned an ID number. You can use this ID in the [mappress] shortcode to display a specific map. Insert into post button: insert the MapPress shortcode for this map into your WordPress post. Click the cursor in the post where you want the shortcode inserted before pressing the button. Save button: save your map. The map will also be saved if you publish or preview a post or page. Geolocation icon (right side of search box): click to enter your current location into the map. To create a new POI, enter an address, place, or business into the search box. You may also enter a latitude/longitude in the format “lat, lng”, or the URL for a KML file (MapPress Pro only). For example, enter “1600 Pennsylvania Ave NW, Washington, DC” for the White House. Click the POI to edit its text in the popup. Then save the POI. Title: enter a title for the POI. Use the map types control in the upper-right to set a map type: you may choose ‘map’ for a roadmap or ‘satellite’ for satellite imagery. When the map is saved it will ‘remember’ its map type, zoom and center, and will be displayed with those settings by default. You can override the settings in the shortcode. Save the map now by clicking the ‘save’ button. Once a map has been saved you can insert it into your post using the [mappress] shortcode. Click the map you just saved to edit it, then click somewhere in your WordPress post. Then click the ‘insert into post’ button to insert the shortcode at that point. (MapPress Pro only) The shapes toolbar on the map can be used to create lines, polygons, circles and rectangles. When drawing a line (called a polyline) or polygon, the shape can be completed by clicking on its last point. Polygons and polylines can also be edited. Tip: Google will not display KML files larger than about 10MB. Google also limits the number of KML files that can be displayed on one map: depending on the size of the files the limit is around 12-15 KML files. POIs can be dragged in the Map Editor to change their sort order. There is also a checkbox on the MapPress settings screen to automatically sort POIs alphabetically. Sometimes it’s impossible to exactly locate a POI using a street address. In this case you can click the POI’s marker on the map and drag it to the correct location. POIs saved this way do not have a street address, they have only latitude/longitude coordinates. For mobile devices or ‘responsive’ themes it is often required to resize a map when browser window size changes. The easiest way to add a map to your template is using the do_shortcode() statement. MapPress stores all of its data in two tables: mappress_maps and mappress_posts. Options are stored in the standard WordPress options table. The MapPress tables will normally be included if you’re backing up your entire WordPress database, or you can export them using MySQL. If you copy your blog from one place to another you will also need to copy the MapPress tables. If for some reason you renumber of change your post IDs you will also need to update the mappress_posts table with the new post IDs. MapPress Pro is the premium version of MapPress. It contains additional features that are described below. MapPress Pro lets you set a different icon for each marker. You may use a standard icon (over 200 are included) or a custom icon you’ve created yourself. You will see a list of icons. Click an icon to select it. Click the link ‘use default icon’ to select the default icon. The default icon can be assigned in the MapPress settings screen. Tip: if you change the default icon on the settings screen, any existing POIs assigned to the default icon will be updated. Some themes change the uploads directory, but you can check the correct icons directory for your blog in the MapPress settings screen. To add your own icons, just copy them to the custom icons directory. Icons must be .png or .gif files. They are usually 32×32 pixels, although you can also use larger sizes. 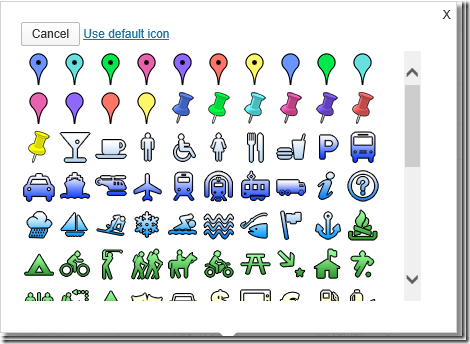 There are many places on the web where you can find pre-made custom icons or icon generators. For example, this site has over 500 custom icons: http://mapicons.nicolasmollet.com. Mashups combine multiple maps into a single larger map. To create a mashup you specify a query for which posts to display. MapPress reads all of the matching posts and combines all of the map locations in those posts on a single mashup map. The mashup query can find a single post, all posts, or posts matching certain criteria, like all posts for a specific tag or category. For example, you might have posts containing business locations. Each post contains some information about the location and a map of that location. A mashup map can be used to combine all of the locations onto a single map. Mashups can be inserted into posts, pages and templates using a shortcode, template tag or widget. This will create a mashup map of the currently displayed posts. Tip: always put the shortcode on its own line (WordPress requires this). Almost any query can be entered for the show_query parameter. MapPress understands the format WordPress uses for the query_posts function. You can find many query examples in the WordPress Codex Article About Query Parameters. The parameters used in the MapPress shortcodes are what WordPress calls ‘query-string’ style parameters, rather than PHP arrays: Codex Article About Query String Parameters. To test if a query is working, you can usually type the query right into your blog’s URL to test it. WordPress allows complex taxonomy queries using arrays. Unfortunately there is almost no documentation about how to enter them in a query string, but it is possible. Here are some examples. See the shortcode parameters reference for a list of parameters. MapPress maps are displayed using customizable map template files. Each file controls a part of the map output. The available POI fields are shown above the editor. Click a field name (such as ‘title’ or ‘body’) to insert the template variable and the correct delimiters. MapPress will automatically include that custom field when the template is output. Each POI has a set of standard properties (title, body, etc.). It also has a ‘props’ array that contains custom properties. Some of the map templates are PHP files. These templates are static – that is, they’re output only once when the map is first displayed. Generally, PHP templates do not need to be modified, so that aren’t supported in the MapPress template editor. If you do need to modify them, the default templates are in the plugin directory /templates. Copy the template to be modified to the theme (or child theme) directory using FTP, then modify the copy using a text editor. Tip: WordPress overwrites all theme files when a theme is updated, so always use a child theme. The MapPress Mashup widget is available from the WordPress widgets screen. The widget can display a custom query, similar to the shortcode. MapPress Pro can automatically generate maps from custom fields. This is useful if you store address data in custom fields or if you need to import map data using TurboCSV. To use this feature, you will need to custom fields containing either a street address or a latitude and longitude on each post. Select the fields on the MapPress settings screen in the ‘Geocoding’ section and save the settings. You may also optionally specify fields for the POI title, body and icon. When a post containing those fields is published or updated, a map will automatically be generated. The map will have a single POI at the specified location. Any errors that occur during map generation will be written to the custom field mappress_errors. Tip: The WordPress Codex explains how to create custom fields. To create a custom field you must actually add it to at least one post and save that post. One way to do this is to create a single post with dummy values for the custom fields. 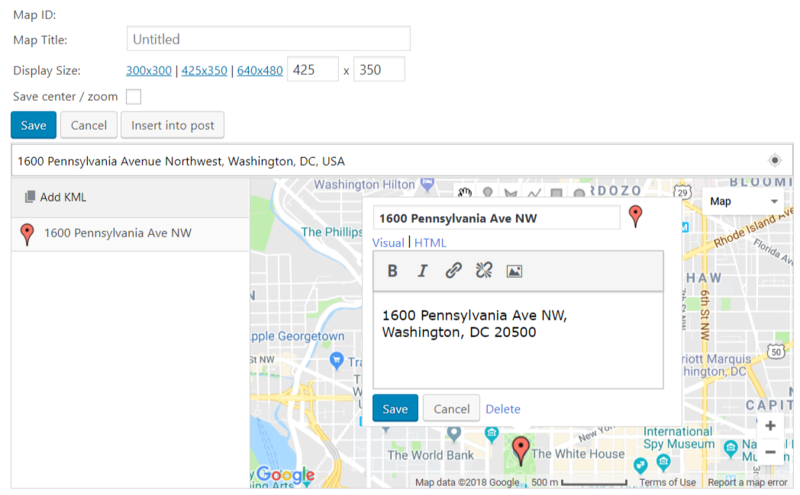 For maps generated using an address custom field, the address must be ‘geocoded’ (converted to latitude/longitude coordinates) before the map can be displayed. Geocoding is slow, up to about 1 second per address, so MapPress saves the result with the map. This allows for faster map display than geocoding the POI each time the map is displayed. Both Google and Nominatim geocoding servers are supported. You must select at least one server in the MapPress settings screen. If both are checked, the plugin will try Google first. If Google returns an error (for example a geocoding limit as described below), it will try Nominatim instead. Google is generally more accurate but it has a usage limit of about 2,500 geocoding requests per day. 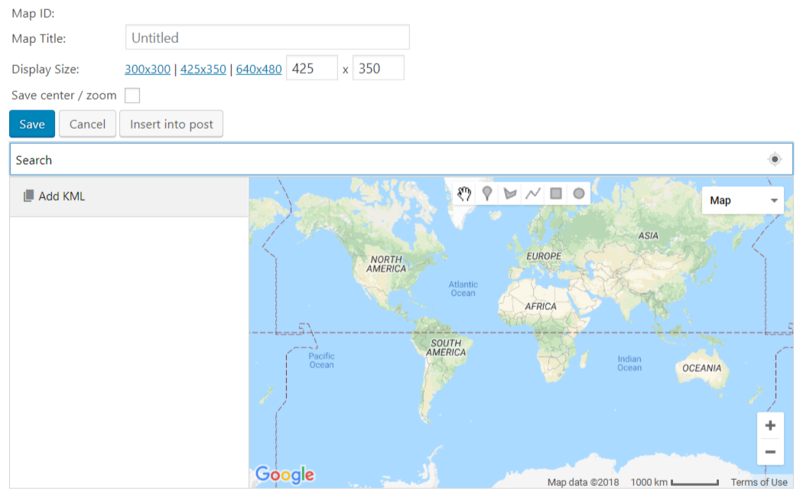 Once that limit is exceeded all geocoding will be rejected: generated maps will show a location at lat/lng (0,0), which is in the ocean near Africa, and you will see error messages in the custom field mappress_errors. Google’s usage limit is by IP address, so it is important to realize that on shared hosts, all the sites combined cannot exceed that limit. In other words, another site on the same host could consume the geocoding limit. You can purchase Google Maps for Business from Google or contact them for usage-based billing. They will give you an API key that has its own (not shared) usage limit. You can use Nominatim, which currently has no usage limits. A map that has been generated automatically can be edited manually, just like any map you created yourself. The map will normally re-generated if the post is published or updated again – overwriting any manual changes. To prevent this, uncheck the setting ‘Regenerate the map every time its post is published’ on the MapPress settings screen. In this case it is necessary to trigger map generation using some PHP code. See The ‘Examples’ section for code samples. Maps can be displayed dynamically by using PHP code in template files. MapPress uses the classes Mappress_Map, Mappress_Poi and Mappress_Options to define maps, POIs and options settings, respectively. Object constructors accept an array of attributes to override defaults settings. Tip: If you specify a center, you must also specify a zoom, and vice-versa. Both parameters are required in order to show the map. If POIs are defined by street address (rather than latitude/longitude) the geocode() method must be used before the map is displayed. This method geocodes the address and defaults the POI title and body, if they aren’t set explicitly. The above code geocodes the POI every time the map is displayed, so high-traffic blogs may encounter Google’s geocoding usage limit (see the ‘Geocoding’ section for details). If so, it may be better to generate the maps using custom fields, or use the Nominatim geocoder. For Google maps, use the Google styled maps wizard. When the style is complete, click the ‘show JSON’ button in the wizard to get the style definition. Copy and paste the JSON code into the MapPress styled maps settings. For Leaflet maps, use the Mapbox Studio online style editor to create and edit styles. The style can be used in MapPress by entering a name and URL in the MapPress styled maps settings (note: use the ‘share’ URL from Mapbox Studio). The new style will appear as a selection in the layers control in the MapPress editor. The default MapPress CSS styles are in the plugin file mappress.css. CSS styles can be overridden there, or in your theme’s style.css file, but those files will be overwritten when you upgrade the plugin or theme, respectively. Instead, WordPress recommends creating a child theme, and making any CSS changes there. CSS styles in child themes are safe from both theme and plugin upgrades. To override specific settings, just include the CSS class you want to override in your theme/child theme style.css file. Any settings there will take priority over the MapPress defaults. In some cases it may also be necessary to override all of the default CSS styles. To do this select the checkbox “Turn off CSS” in the MapPress settings screen – but be sure to copy all of the map CSS styles from mappress.css to your theme’s style.css. The settings screen controls defaults for the plugin. Some of the settings can also be set for individual maps using the MapPress shortcode or template tags. Underlined settings are only available for MapPress Pro. Automatic map display Automatically display maps in each post without adding a shortcode. If a shortcode is present in a post this setting is ignored. Directions Select the type of directions you want to offer. Directions links appear in map POI Popups. Default zoom MapPress uses this setting to set the zoom level for POIs entered by latitude / longitude. This parameter is ignored for POIs entered as a street address or place; those POIs have a default ‘viewport’ that is used to set the zoom instead. Mashup thumbnails Check to automatically include featured image thumbnails in mashup POIs. The thumbnails are taken from the post each POI is linked to. Thumbnail size Select an existing thumbnail size or specify a size in pixels. Note that using a default size is much faster than resizing on display. Default icon Select a default icon to use for all maps. Any POI that doesn’t have an icon explicitly assigned to it will use this icon. Custom icons directory Directory for custom icons. Styled maps Provide a style name and enter JSON directly from the Google Styled Maps Wizard. Default style Select a custom style to be used as the default on all maps. Geocoders Enter the geocoders to use for geocoding. Google has strict usage limits. Nominatim is sometimes less accurate but has no limits. You may select both geocoders. MapPress will try Google first. If there is no result (for example if you have reached your usage limit), then Nominatim will be used. 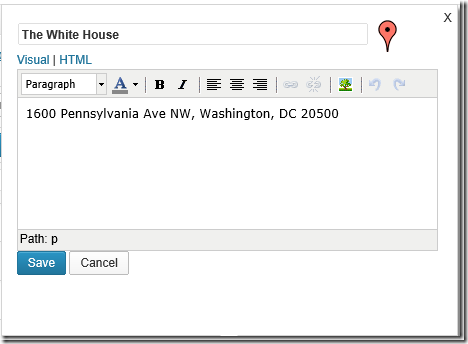 Geocoding fields Select custom fields to use to automatically create maps. Language Select a language. For Google, this affects that map tiles, map type and zoom controls, geocoding (search) results and directions. If not specified, Google will use the language setting in the user’s web browser. Google provides a spreadsheet with a list of supported languages. For Leaflet, the language setting controls only geocoding results. Map tiles are always served in their ‘native’ language, e.g. Chinese for China. You can use Mapbox tiles if you prefer English. All other texts come from MapPress. See the MapPress FAQ for information on creating and editing translations. Country Provide a default country to use as a preference for searches. For example, if you enter ‘Toledo’ Google will normally display Toledo, Ohio. But if you set the country code to ‘ES’ (for Spain) it will show Toledo, Spain. Directions server If you have selected ‘Google’ for directions, you may enter a local Google maps server (for example “maps.google.fr” or “maps.google.de”) to obtain directions in your own language. Scripts Check this box to load MapPress scripts in the footer (the default). Uncheck it if using other plugins that use AJAX to fecth content (these plugins typically don’t call the WordPress theme footer function). API key Enter your Google Maps API key. See the FAQ for tips on setting it up. Map sizes Enter up to three default map sizes. These sizes are presented as defaults in the map editor. Force resize Resize all maps from a given size to a new size. Underlined parameters are only available for MapPress Pro. center lat, lng blank Specify a center for the map using a latitude/longitude, for example “-32, 22”. If blank, the center saved with the map will be used. For mashups and maps with no saved center, the map is automatically centered and zoom to show all of its POIs. terrain blank Map type to display. You may also use a custom style name if you have created custom styles in the MapPress Pro settings. name string blank Set the name for the map. If no name is provided, the first map on the page is automatically named ‘mapp0’, the next is named ‘mapp1’, and so on. Called once for each POI, just before the map is displayed. Used to set a specific icon ID for the POI. The $iconid parameter contains the icon ID of the icon that would normally be displayed, and $poi contains the POI object. Called once just before a map is displayed. The map is passed by reference, so it can be modified – for example to add or remove POIs, change icons, etc. This action is called after a map is saved to the database. This action is called just after a map is deleted from the database.